The trigger for this article was a question I got from Alan. He wanted to know how he could get, from within a PowerShell script, a report of all the tasks that were run against a specific virtual machine during the last seven days. The VI Toolkit (VITK) has a Get-Task cmdlet, but that cmdlet is in the current release of the VITK a bit restricted in it’s use. See the community thread “Determine the “lineage” of a VM | From which Template was a given VM authored?” for a further discussion on this. Since it became clear that the VITK wouldn’t give me what I wanted, the only possible alternative was to go to the VI APIs. Every time I need to use the VI APIs I start by looking in the API Reference Documentation. This document, which is in fact a web-based search tool, has a rather straight-forward layout. In the left pane you find the main menu and in the right pane you will find the details on everything you select in the left pane. Where you start your search in the API Reference depends a bit on what you have to start with. Alan’s question gave me 2 keywords to start with, “task” and “history”. 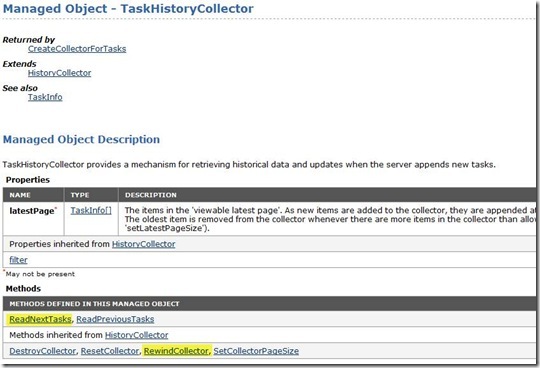 Looking in the SDK Reference under the Managed Objects Types we find an object which is called TaskHistoryCollector. For that object we see, in the right pane, that it is returned by a method called CreateCollectorForTasks. The TaskFilterSpec we will tackle later. One more thing to take into account, the CreateCollectorForTasks method returns a ManagedObjectReference, or MoRef. Something like a pointer to the actual object. 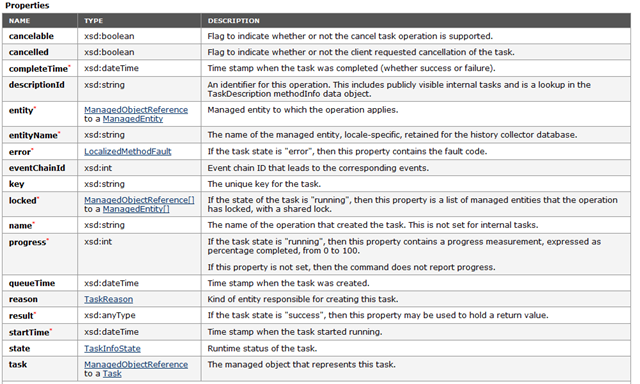 But to call methods on the collector from within PowerShell we need the object itself. Now that we have the object lets look further. the RewindCollector, which doesn’t need any parameters. 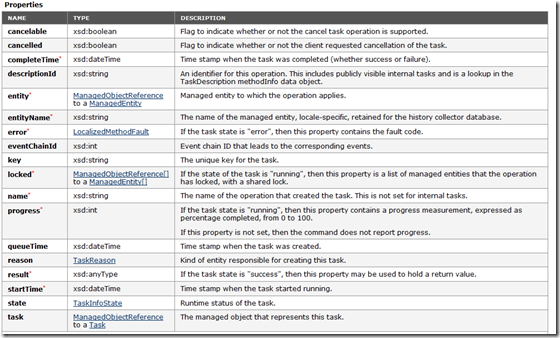 the ReadNextTasks method which needs a parameter to specify the number of task events to read in a call to the method. When there are no tasks left to read the method will return $null. Now let’s have a look at the filter object. Quit a lot of options available. But in our case we were looking for all the tasks during a specific period of time. The time property seems to do just that. 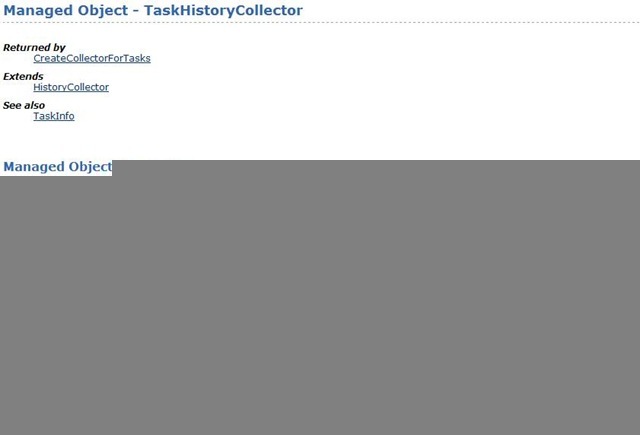 Clicking on the TaskFilterSpecByTime hyperlink shows us the details of the object. Just what we needed. We need to populate the beginTime property with with the timestamp of seven days ago. 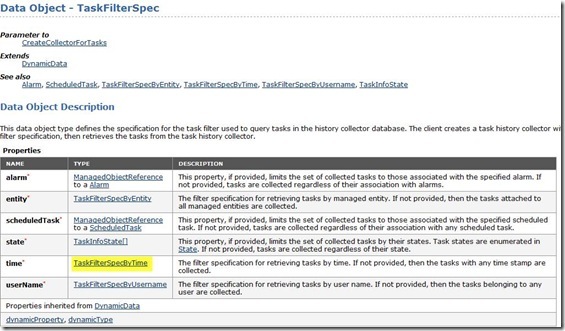 Now for the 2nd part of our query; Alan was looking for the tasks against a specific VM. 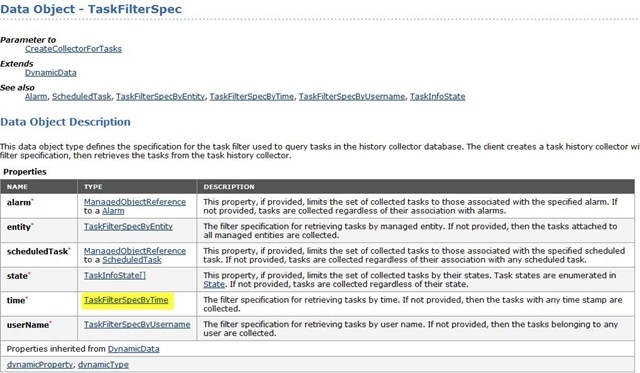 Let’s have a look at the entity property of the TaskFilterSpec object. It seems we need the MoRef (managed object reference) for the VM in question. In the script we just show the timestamp and the name of the task on screen, but there are a lot more properties in the TaskInfo object. In conclusion, I hope this short article made using the VI APIs in your PowerShell scripts a bit less frightening and a bit more accessible. And if you want to learn more on the SDK and VI APIs have a look at the Programming Guide. 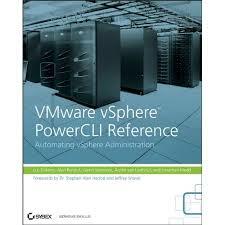 Chapters 2, 3 and 4 will give you a good understanding of the VI internals.